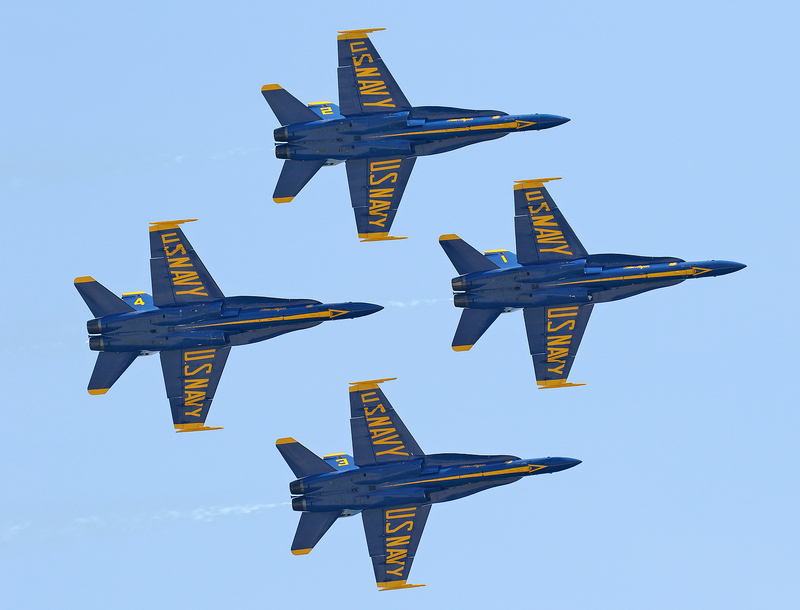 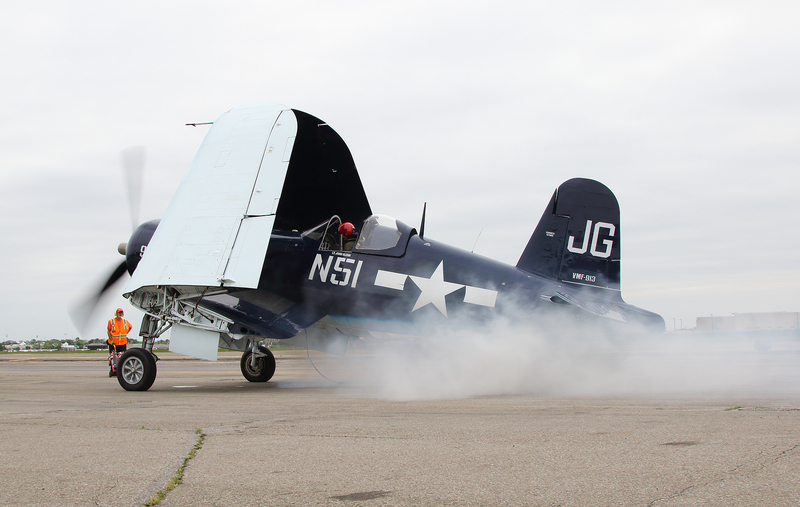 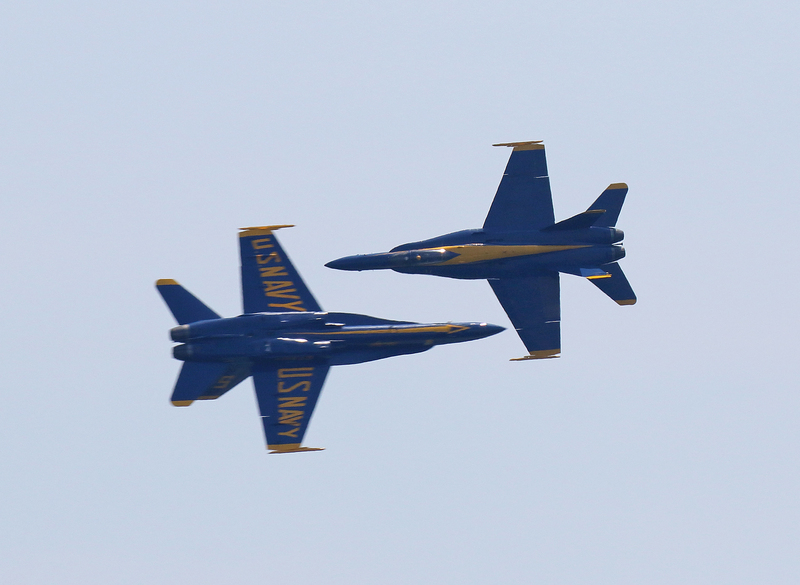 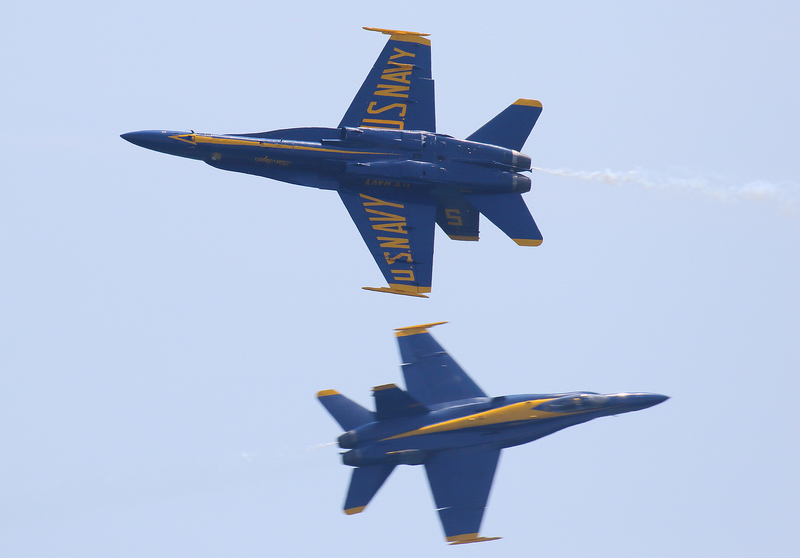 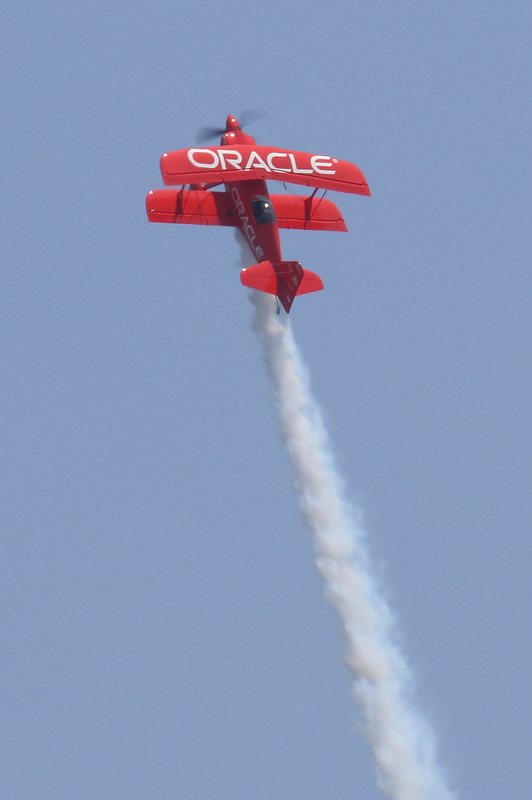 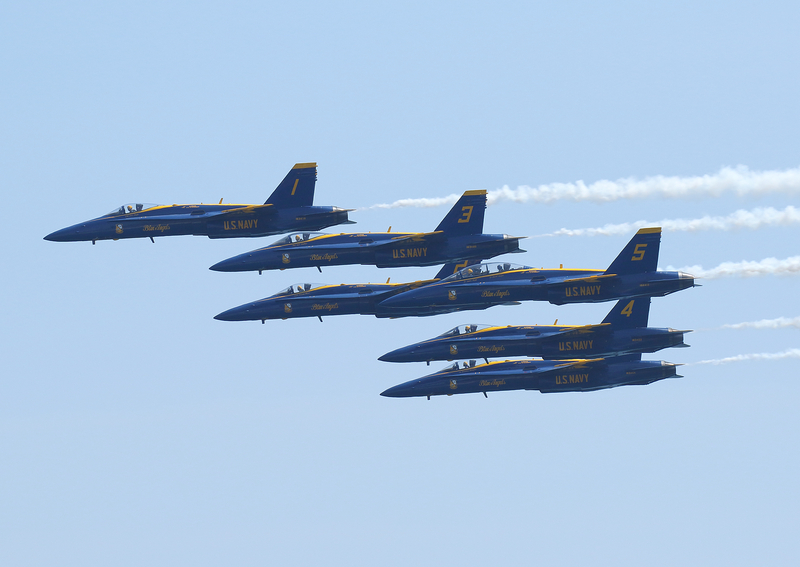 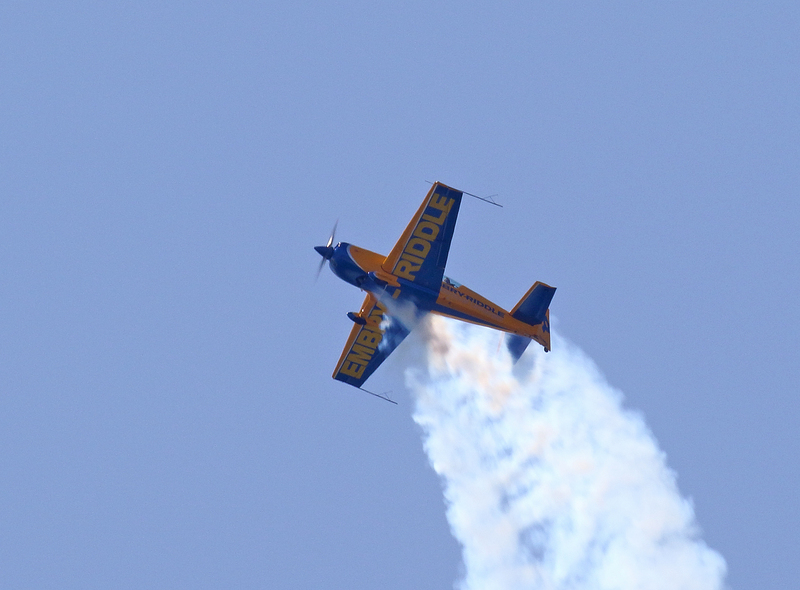 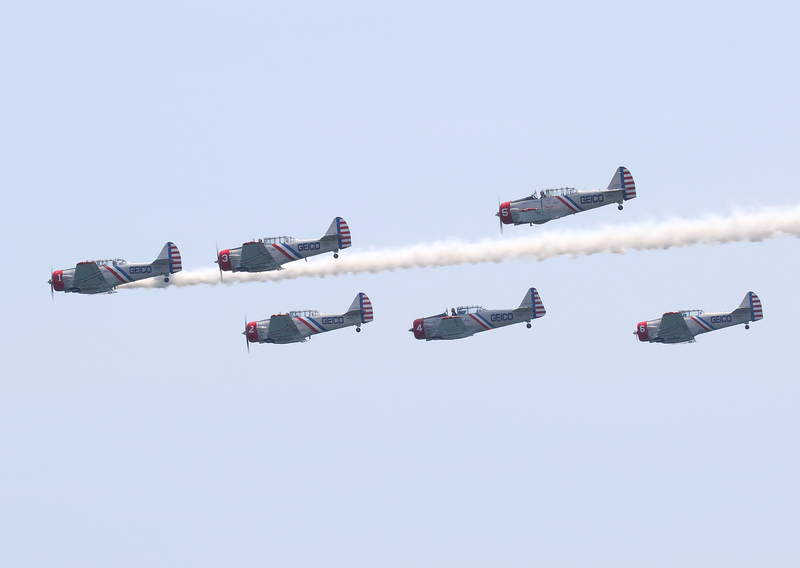 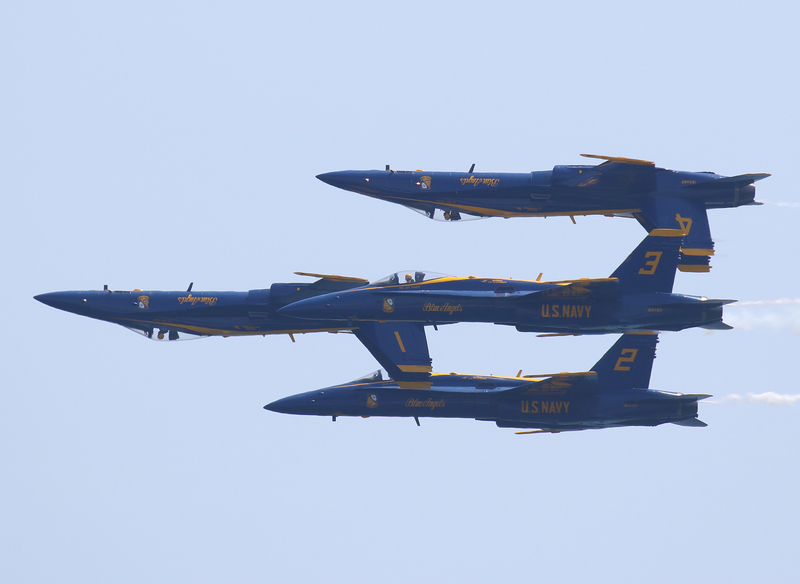 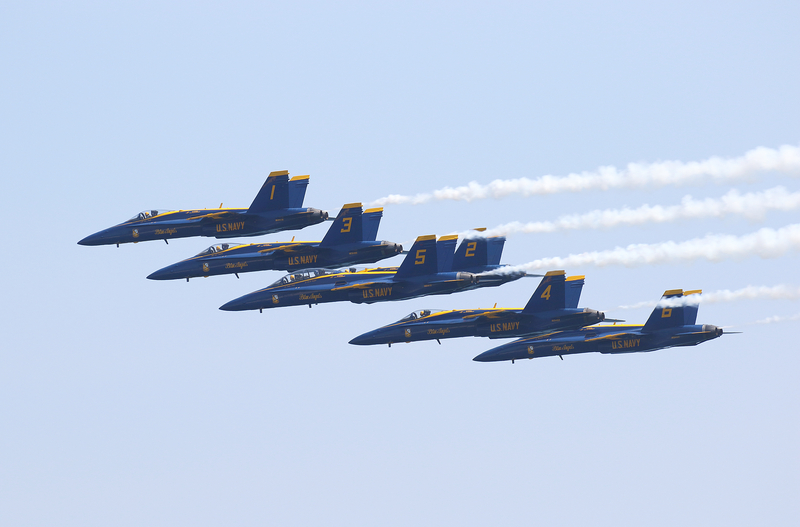 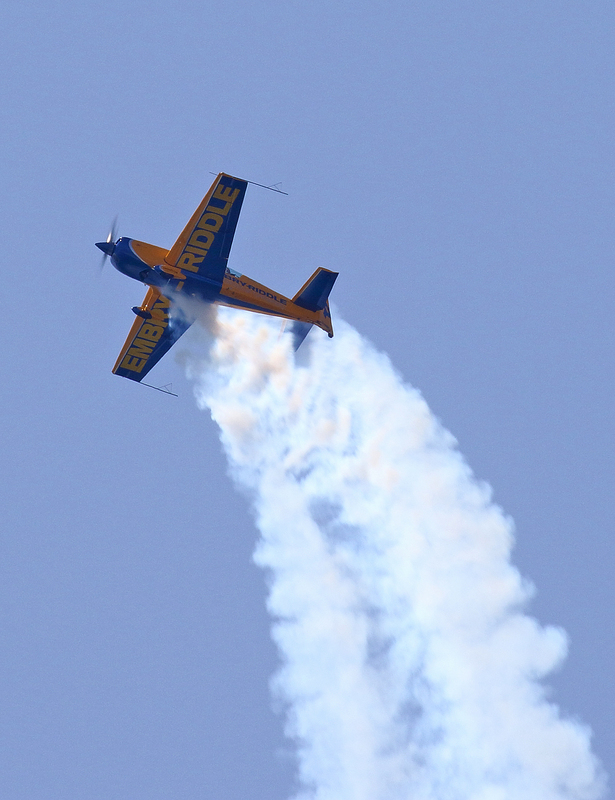 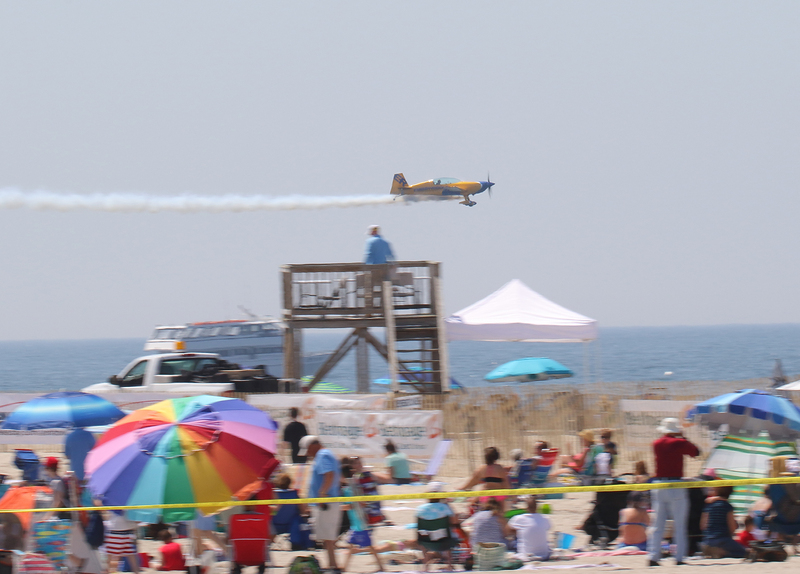 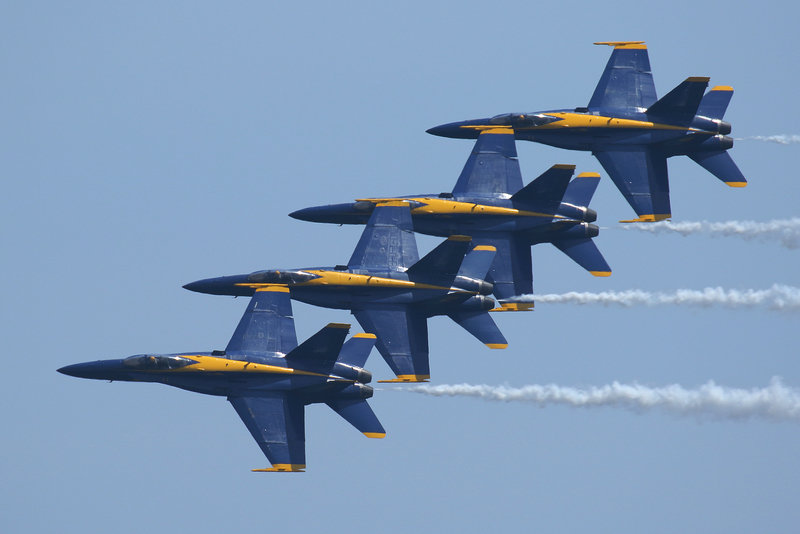 The 15th annual Jones Beach Air Show was held this past Memorial Day weekend at Jones Beach State Park on Long Island. 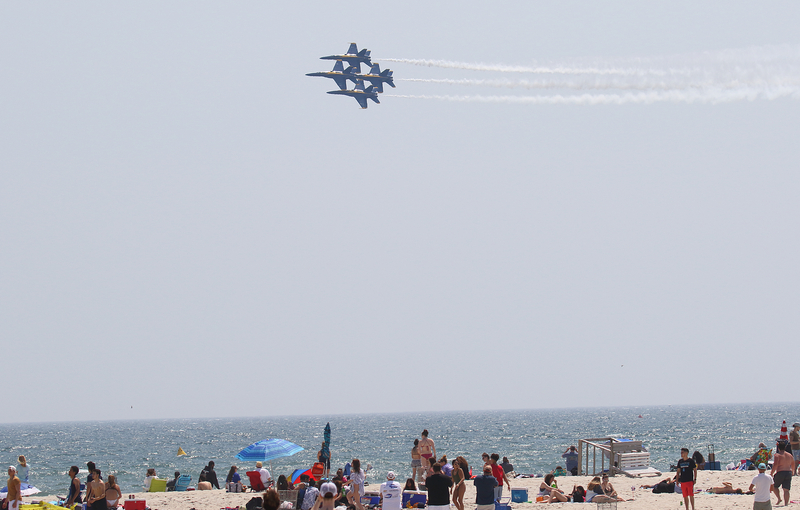 Due to the huge size of the Jones Beach facility and the proximity to New York City, the show always draws a huge crowd. 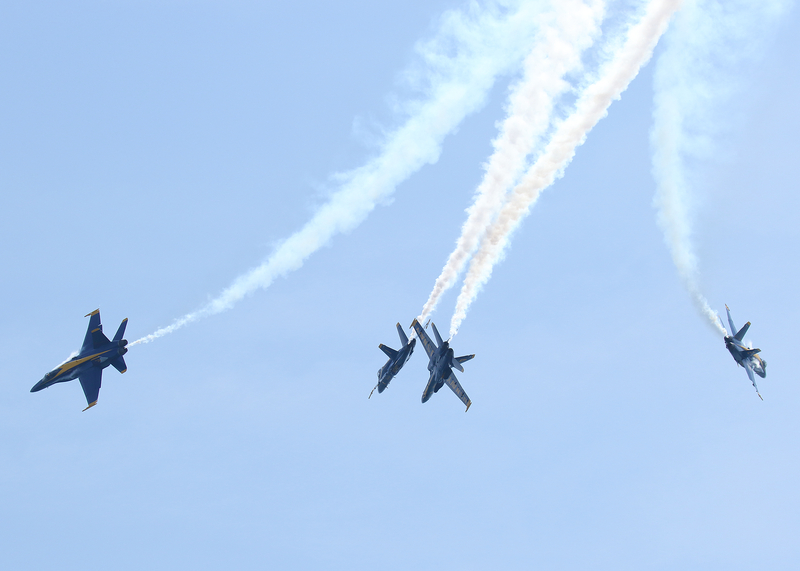 This year set the single day attendance record of 207,000 people. 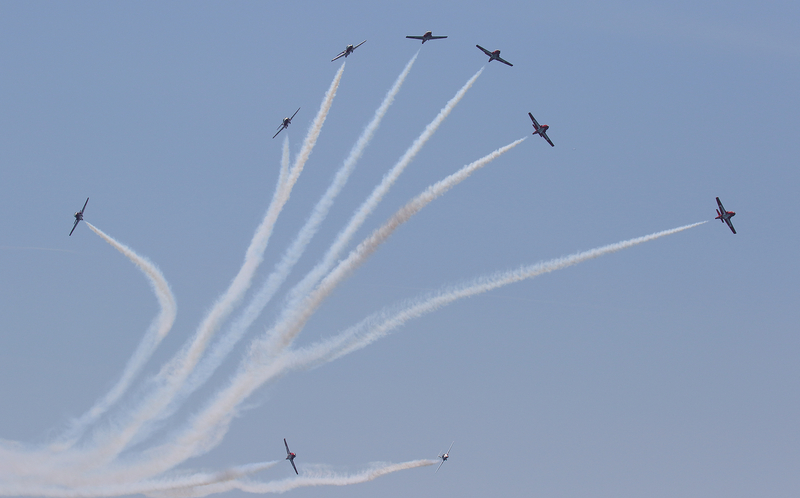 The 106th Air National Guard Rescue Wing are regular participants in the show. 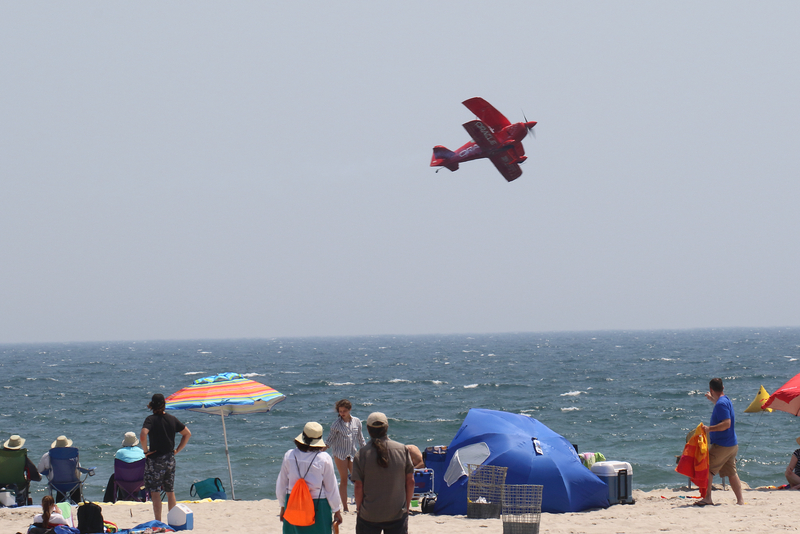 This Westhampton Beach based unit demonstrated their Combat Search and Rescue Capability. 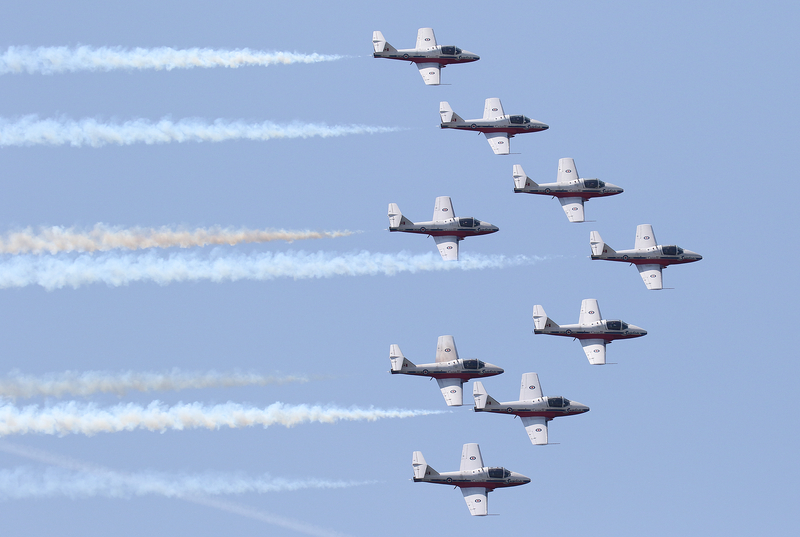 Other regular performers included the local based GEICO Skytypers with their low-altitude precision formation flying demonstration. 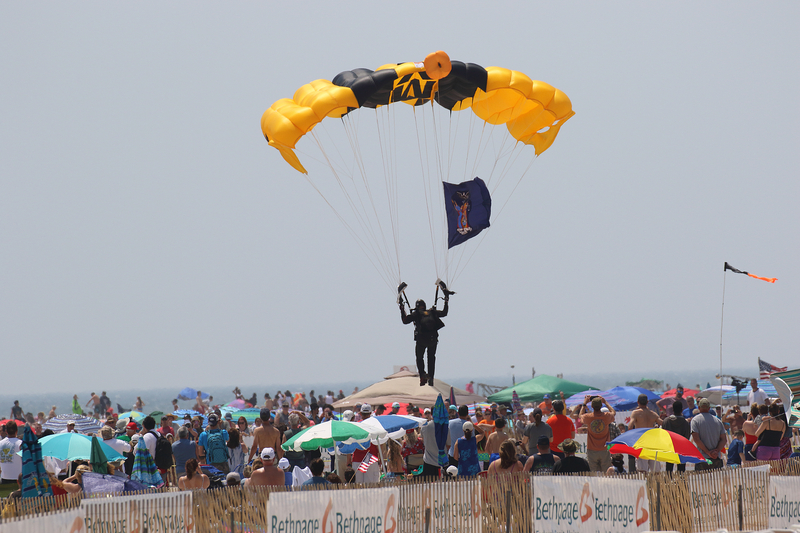 The US Army Golden Knights performed various parachute jumps during the show. 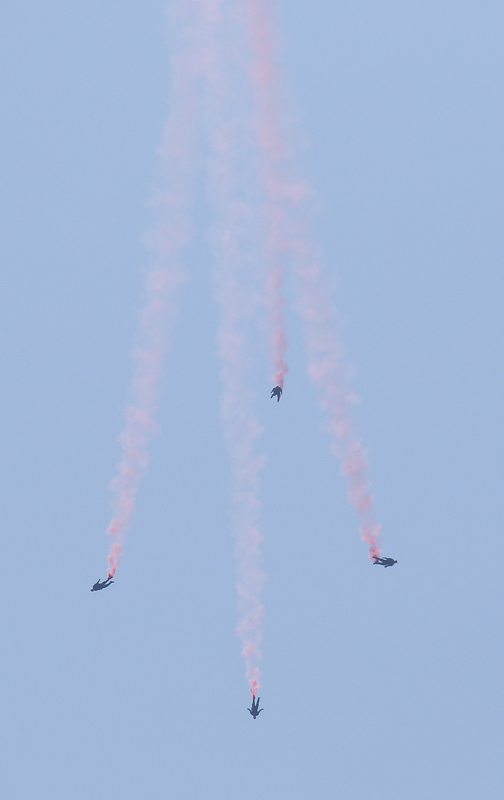 Demonstrating how they recover from a failed parachute deployment was certainly a thrilling highlight. 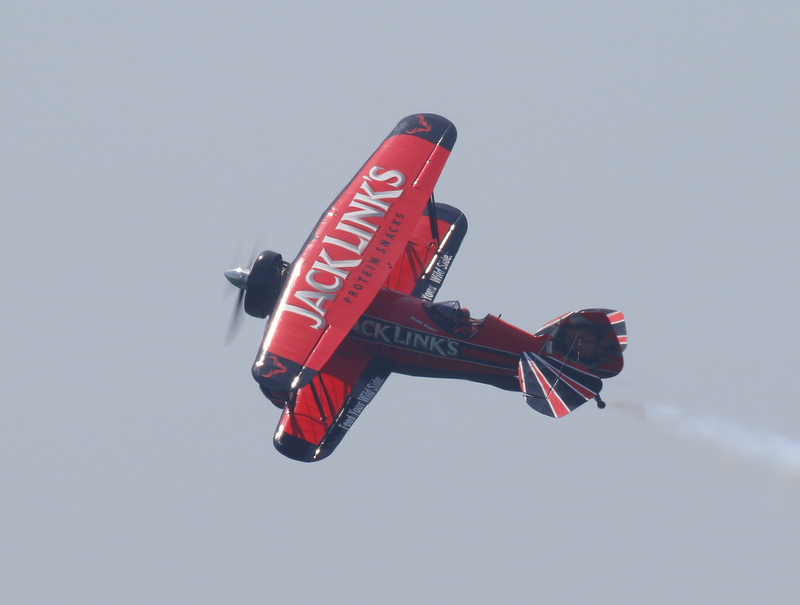 High energy, high performance aerobatic skills were demonstrated by David Windmiller, Matt Chapman and the legendary Sean Tucker. 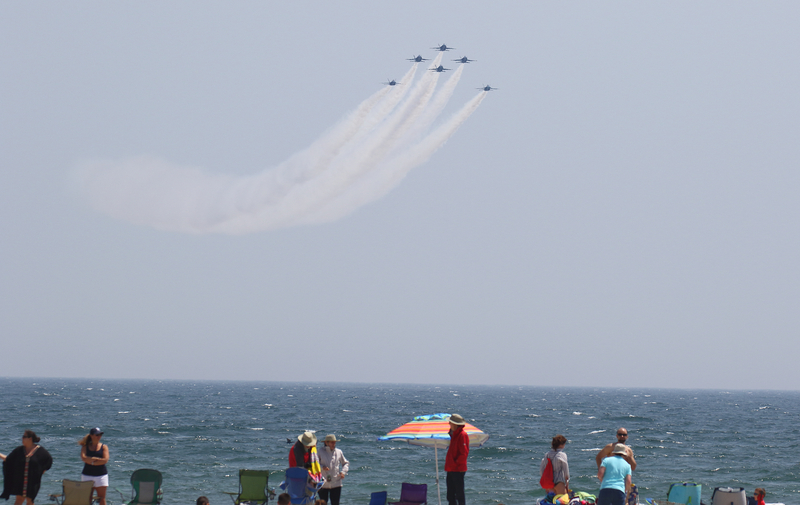 They had beach goers staring straight up at the sky in amazement. 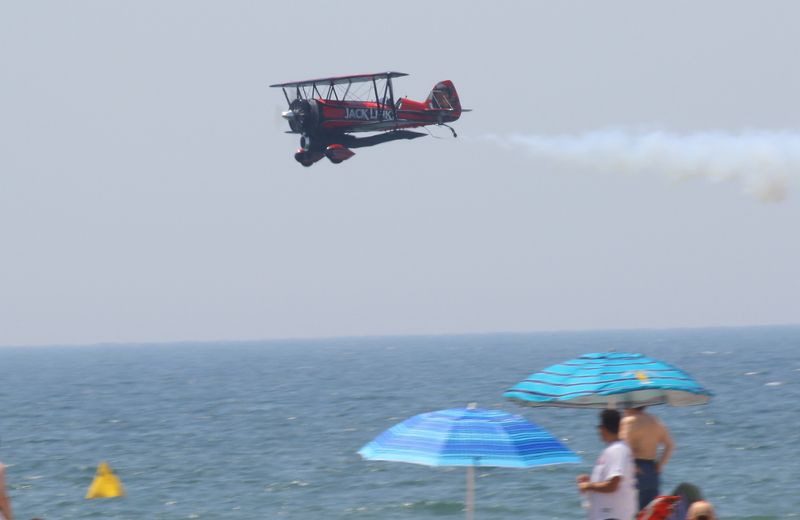 John Klatt also brought the jet powered Waco biplane back for more exciting stunts. 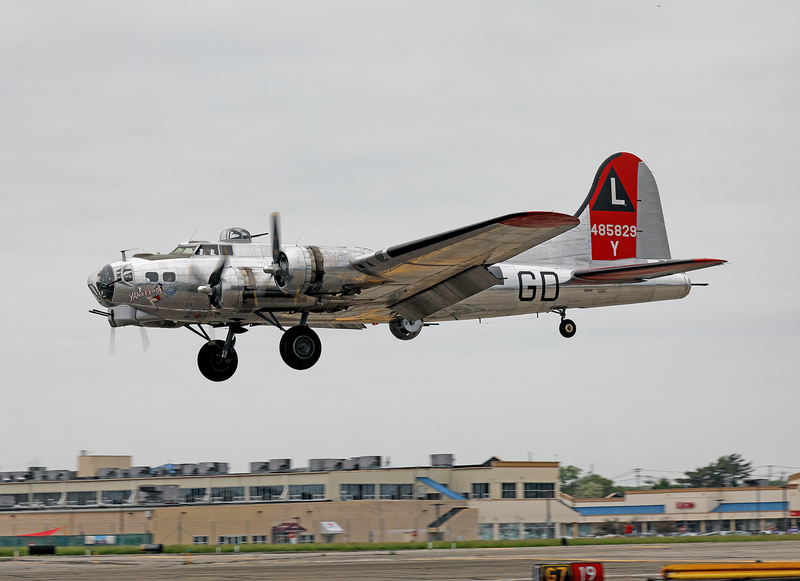 The American Airpower museum sent out some of their warbirds to fly some passes and they were joined by the Yankee Air Museums’s B-17 “Yankee Lady”. 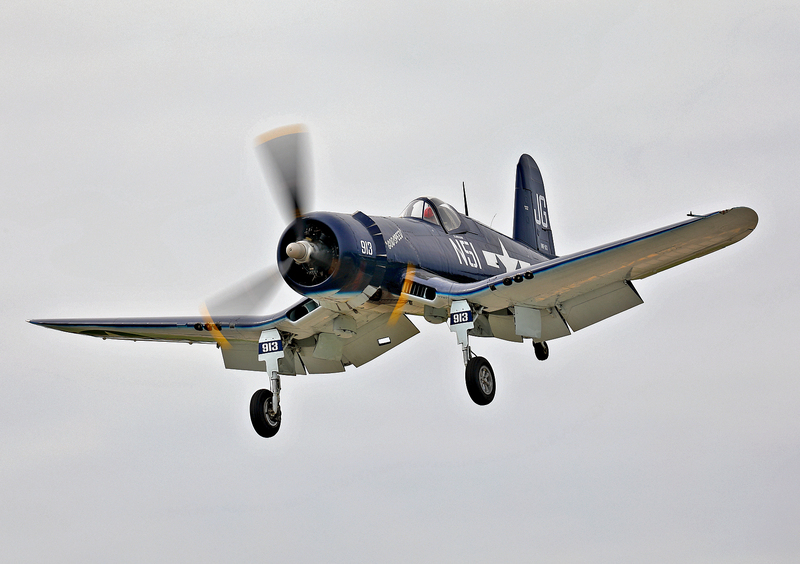 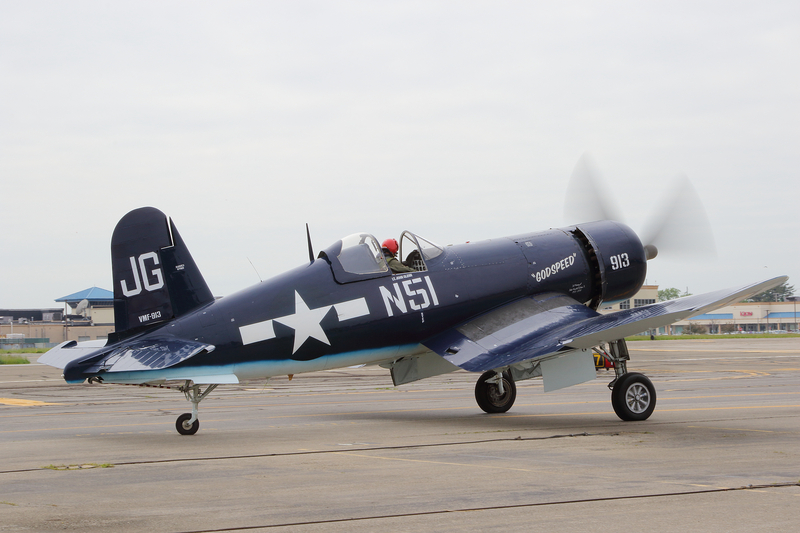 It’s always a thrill to see these perfectly restored historic aircraft flying in the show. 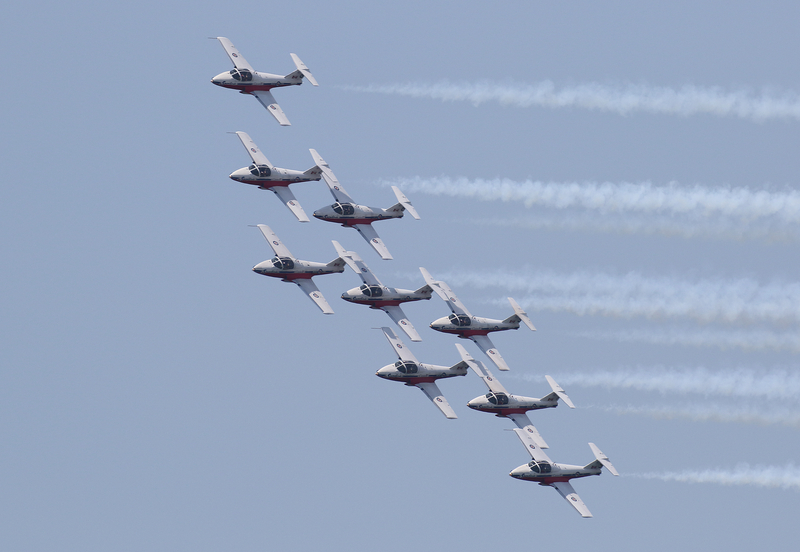 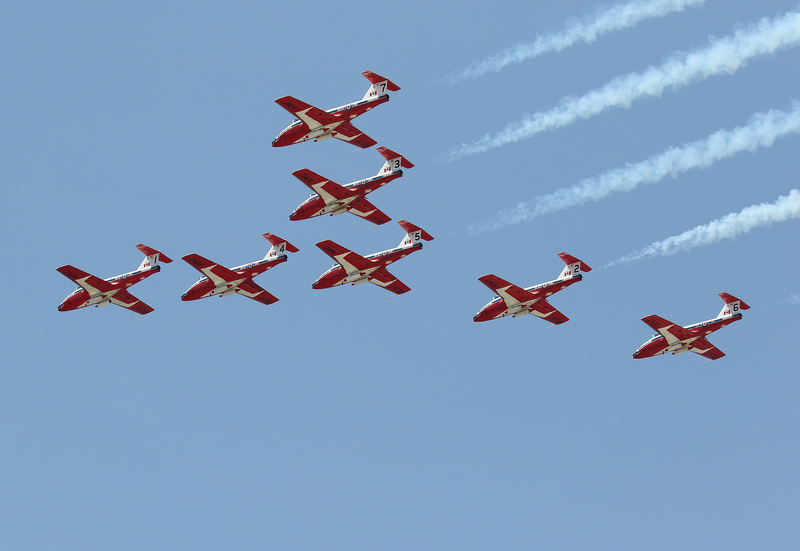 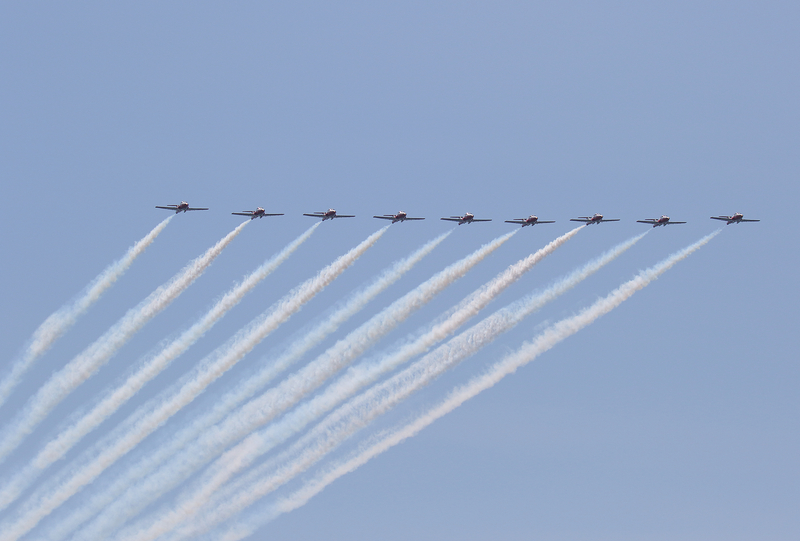 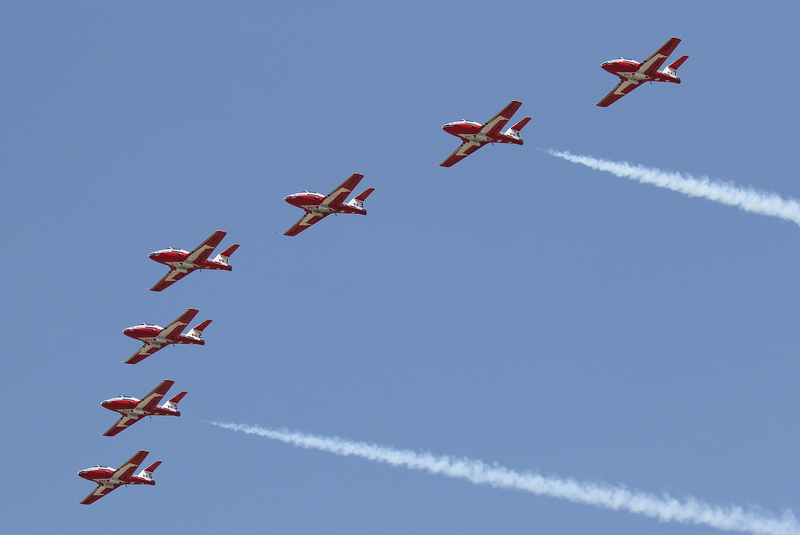 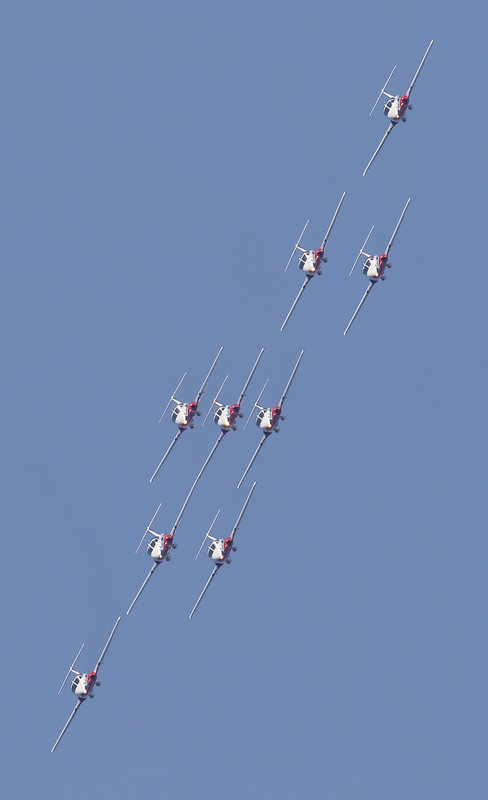 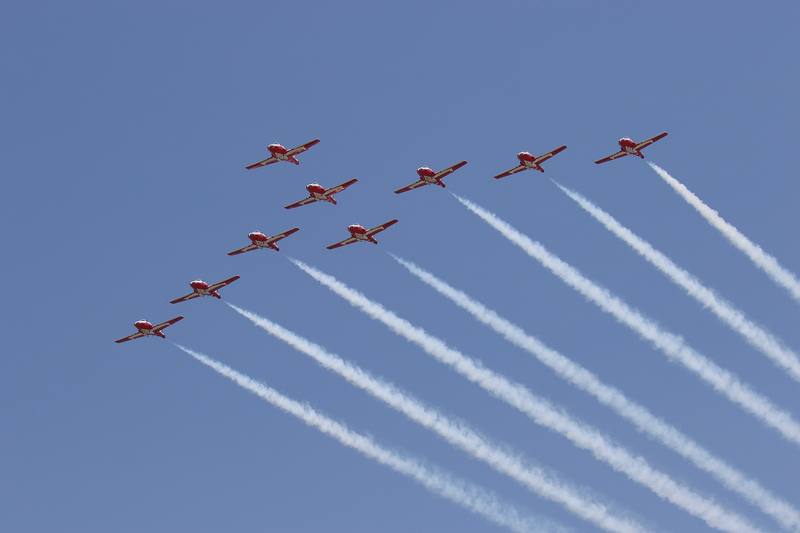 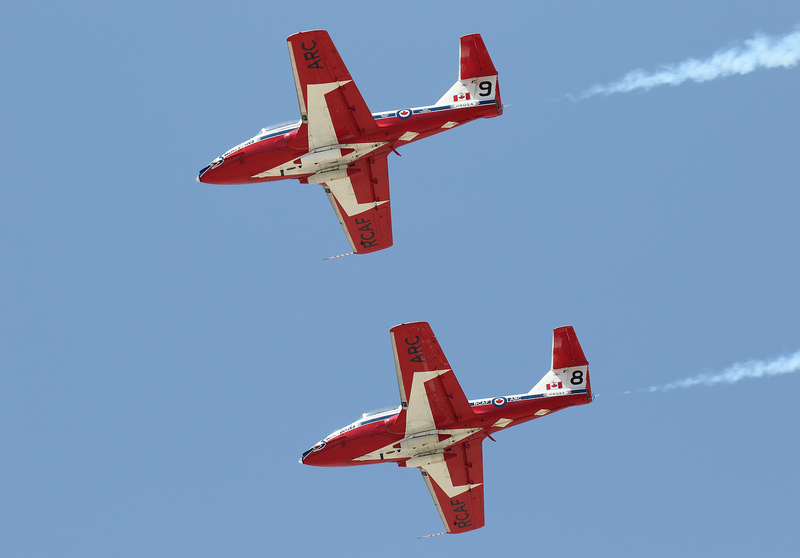 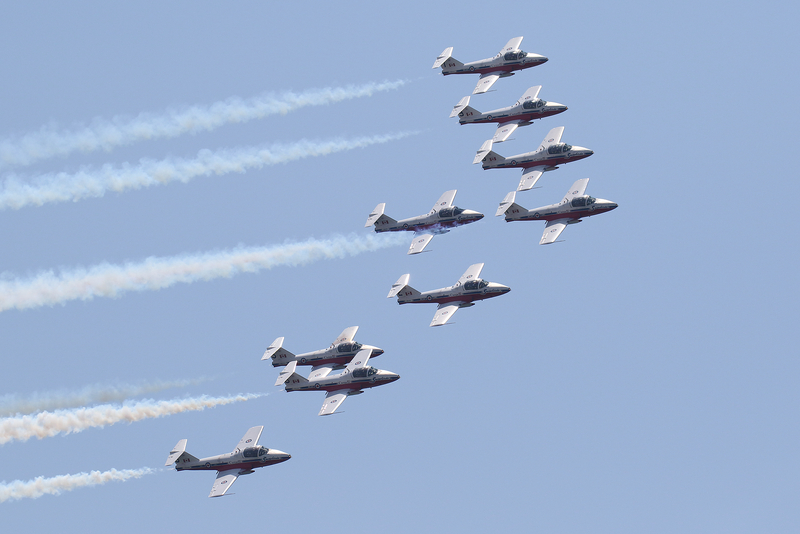 The Royal Canadian Air Force Snowbirds brought their graceful, precision show to the beach. 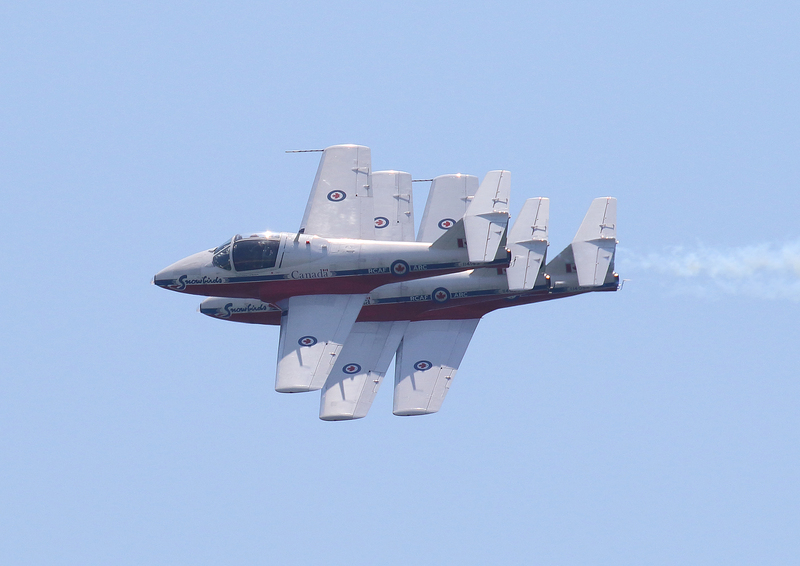 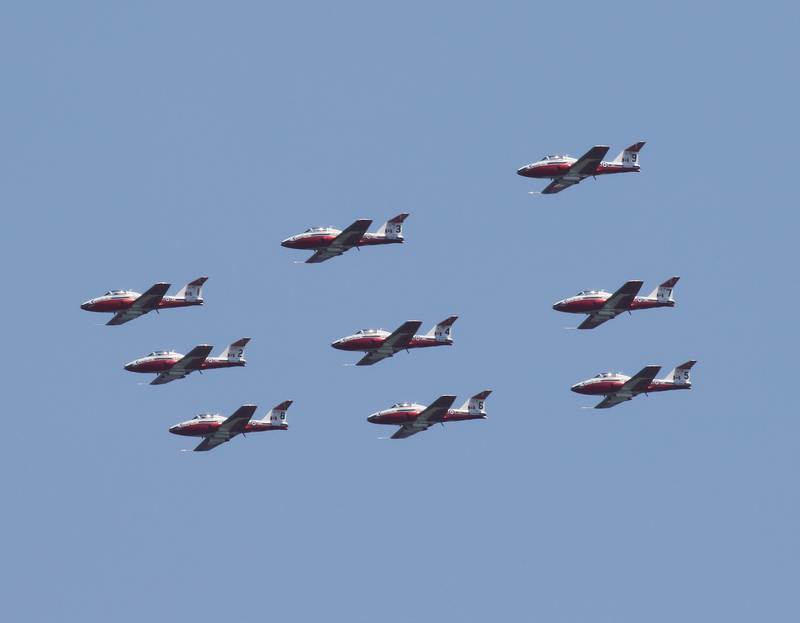 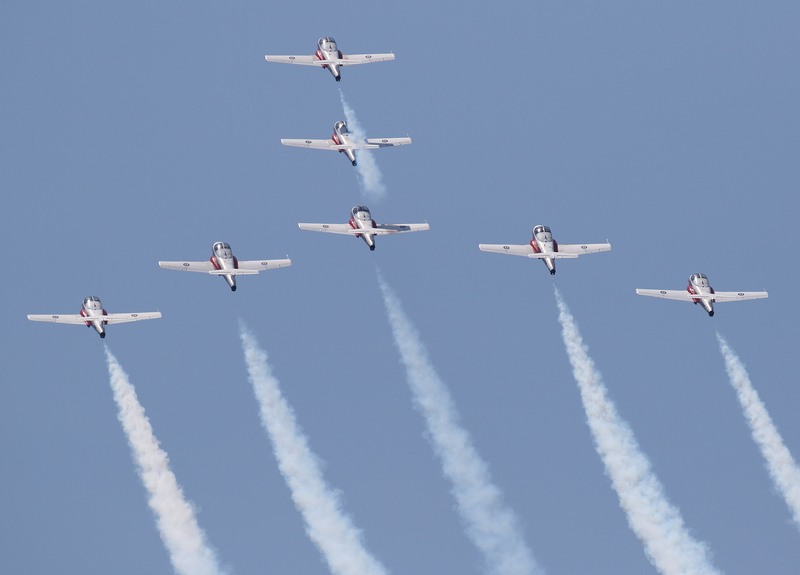 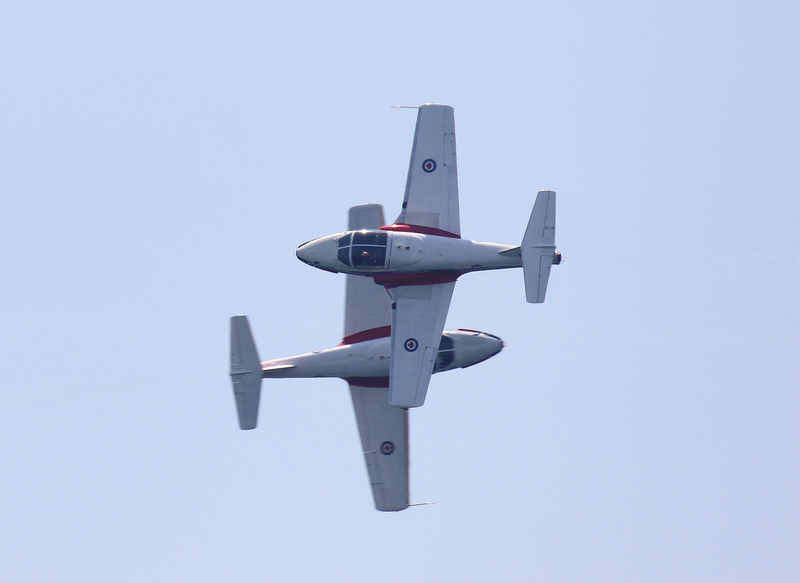 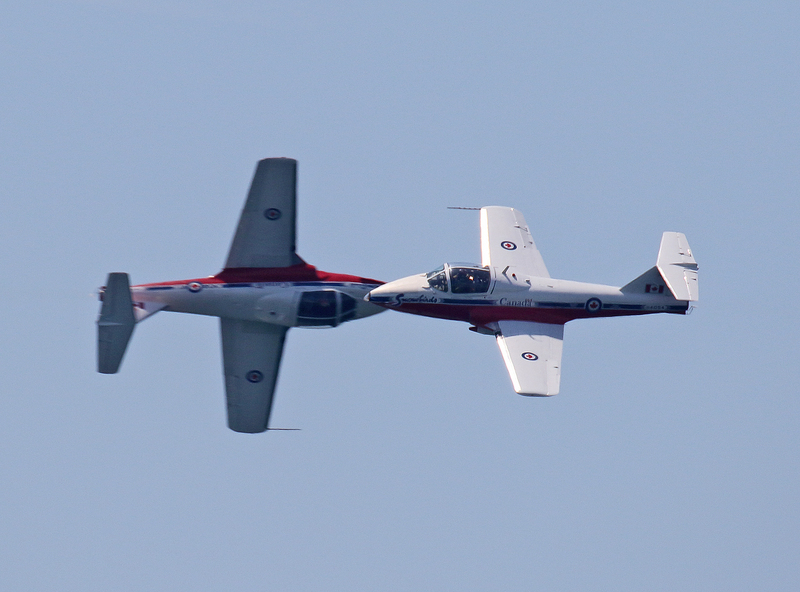 They fly nine CT-114 Tutor jets in various formations and represented the Canadian Forces well. 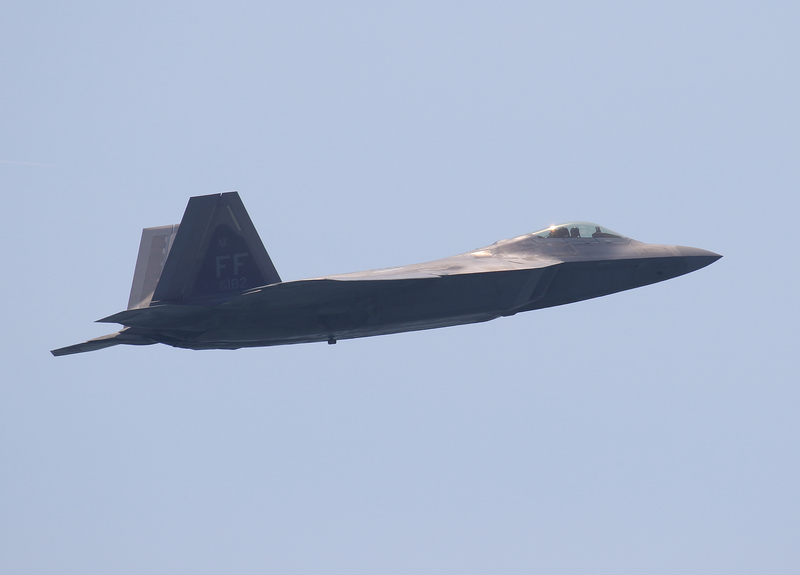 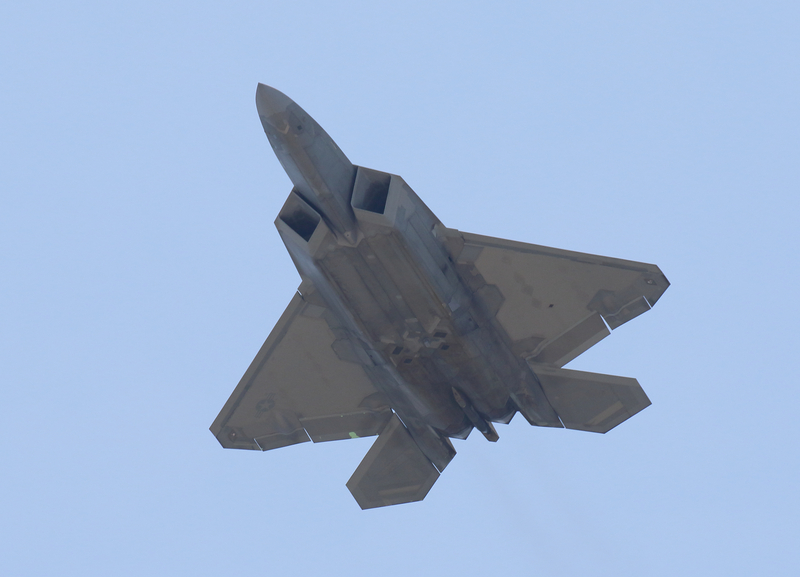 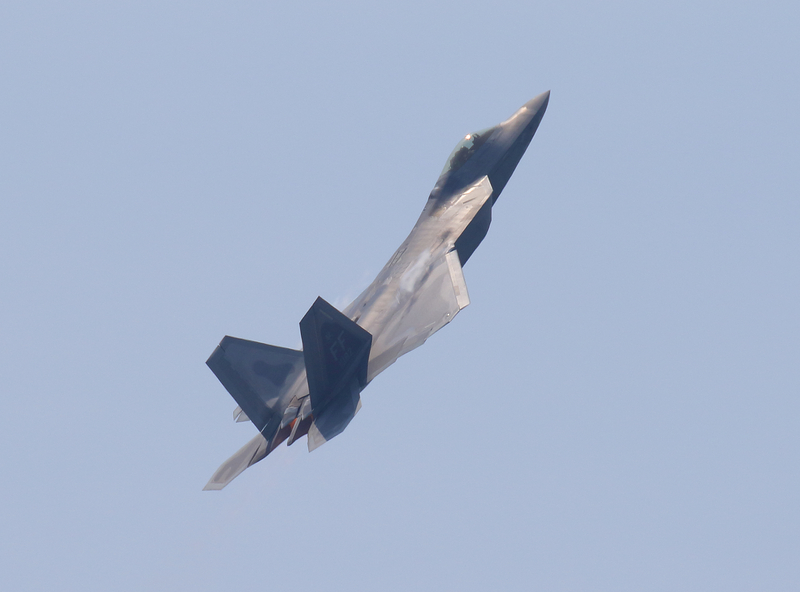 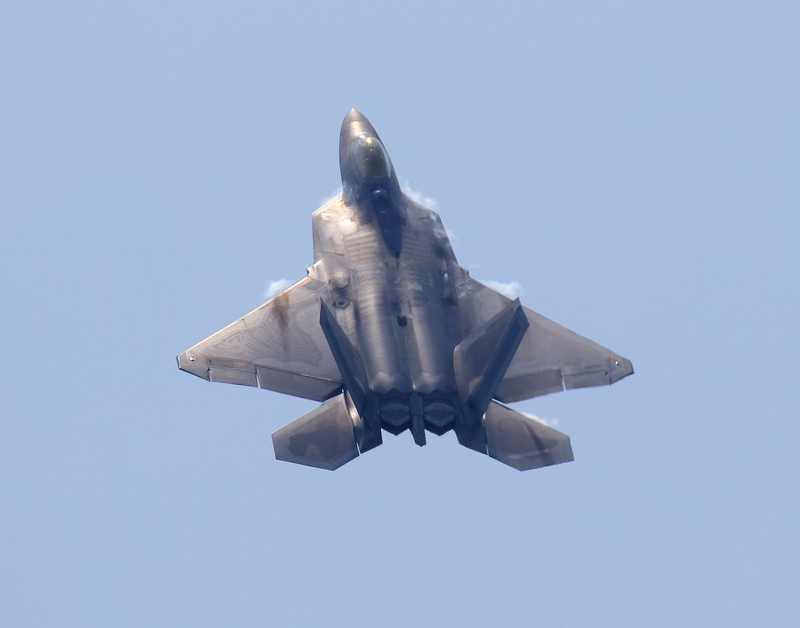 The US Air Force brought the F-22 Raptor demonstration team to the show. 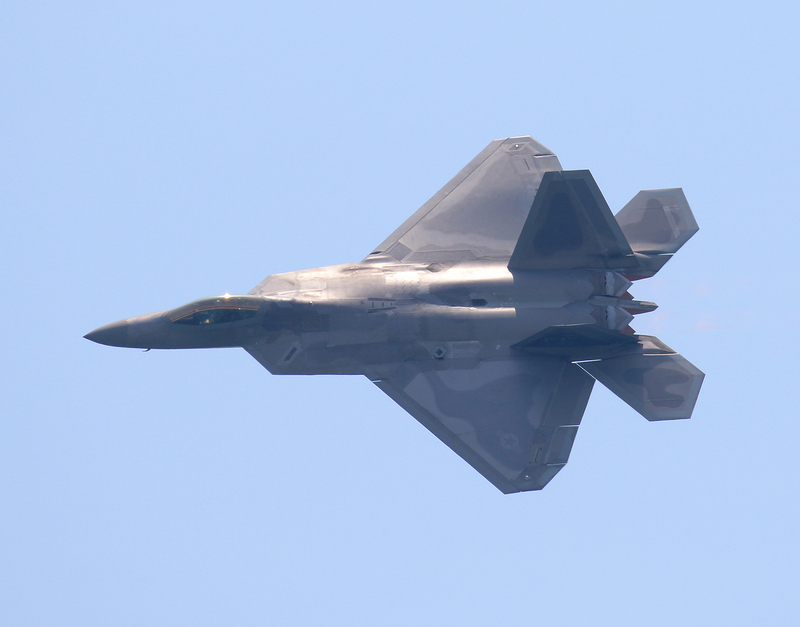 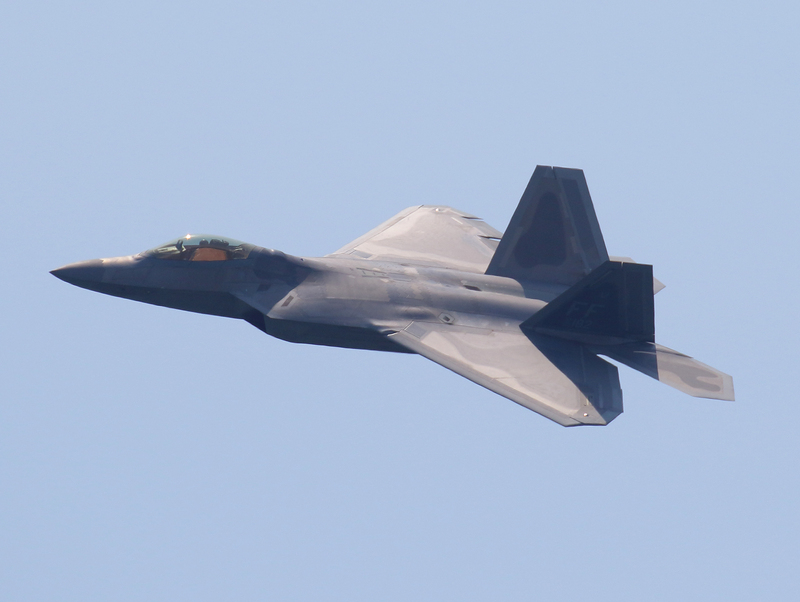 The Lockheed Martin F-22 is a fifth generation air dominance fighter with stealth capabilities. 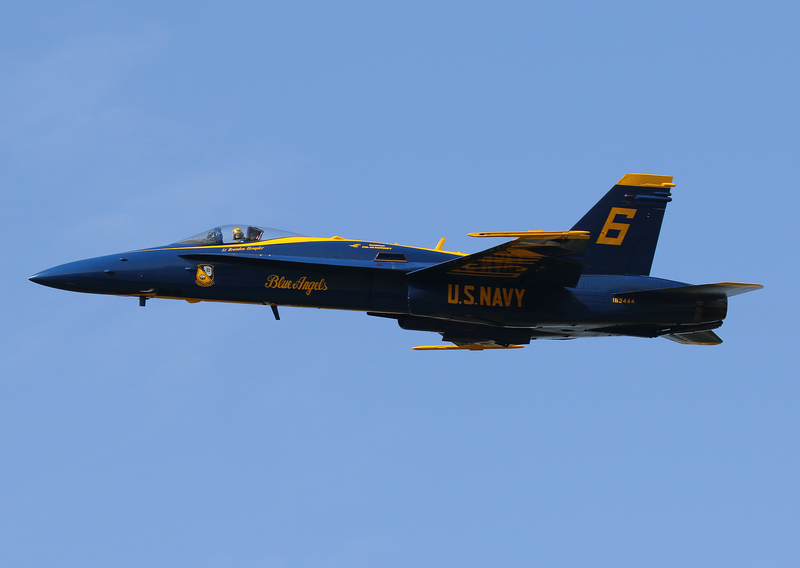 The pilot Major Paul “Loco” Lopez delivered a superior performance of precision aerial maneuvers to showcase the unique capabilities of this aircraft. 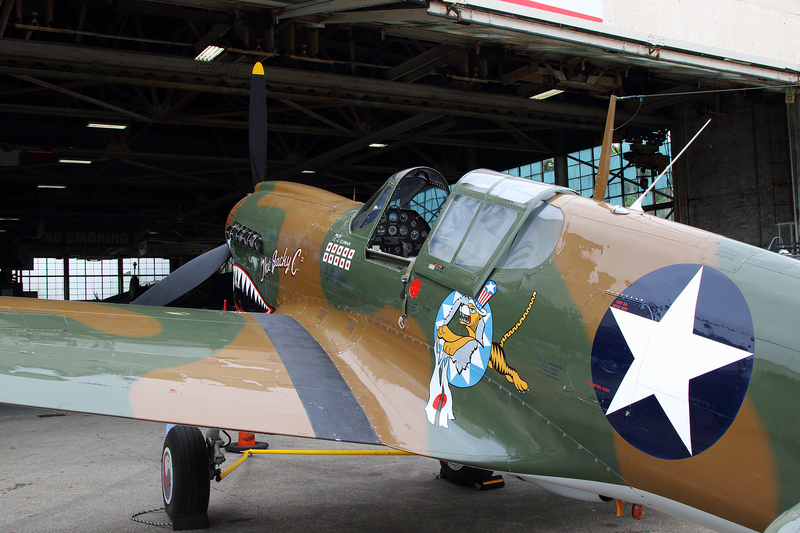 He teamed up with a P-51 Mustang for the USAF Heritage Flight at the end. 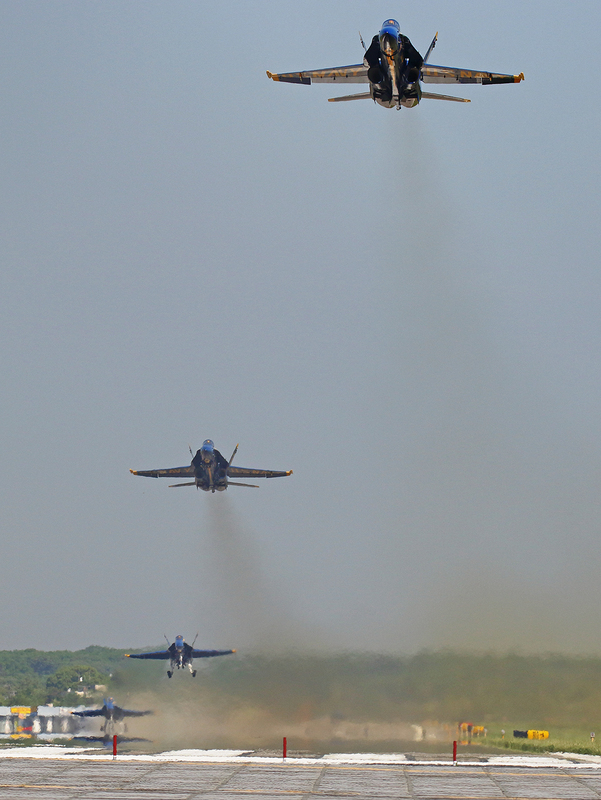 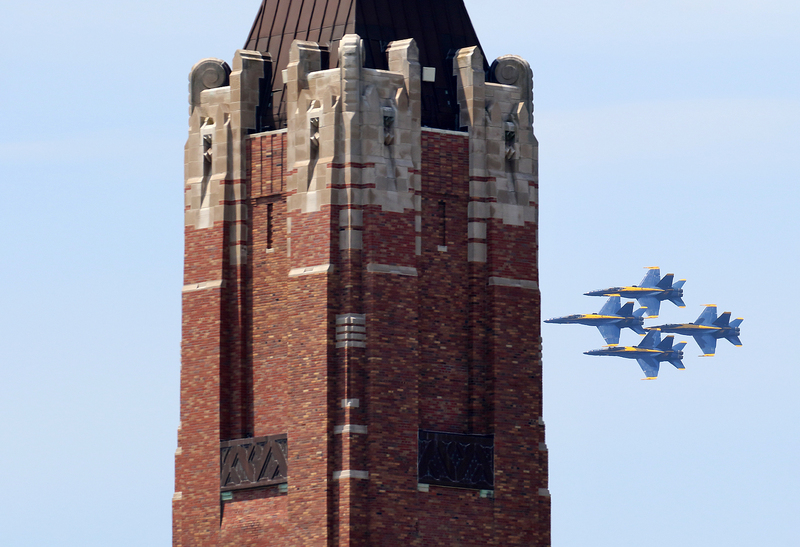 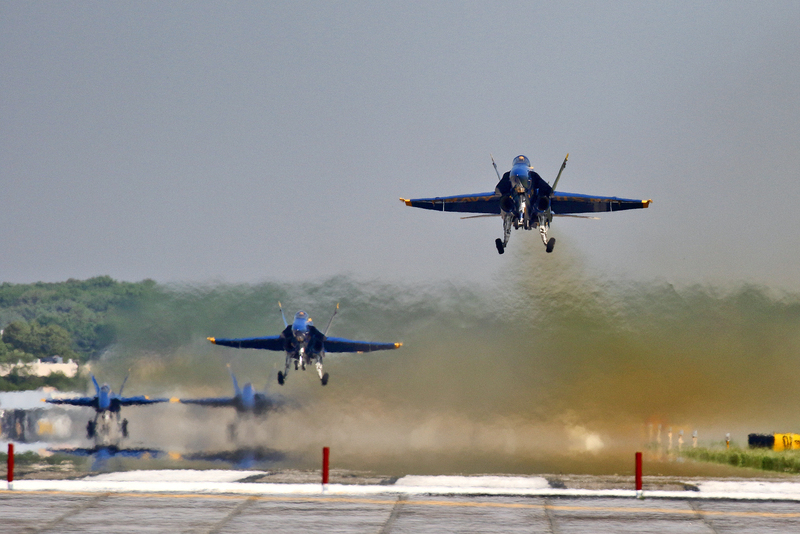 The headliners this year were the US Navy Blue Angels demonstration team. 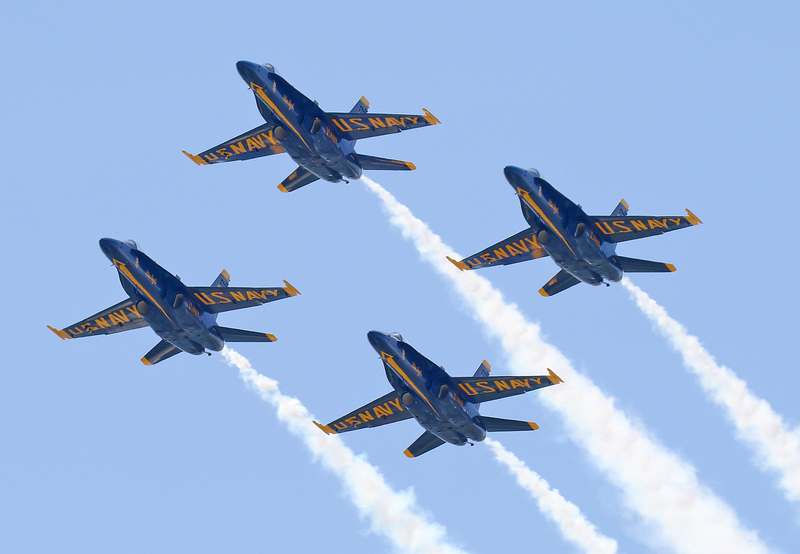 They represent the US Navy and Marine Corps with a roster of 17 officers led by Cdr Eric Doyle, and 100 enlisted sailors and Marines. 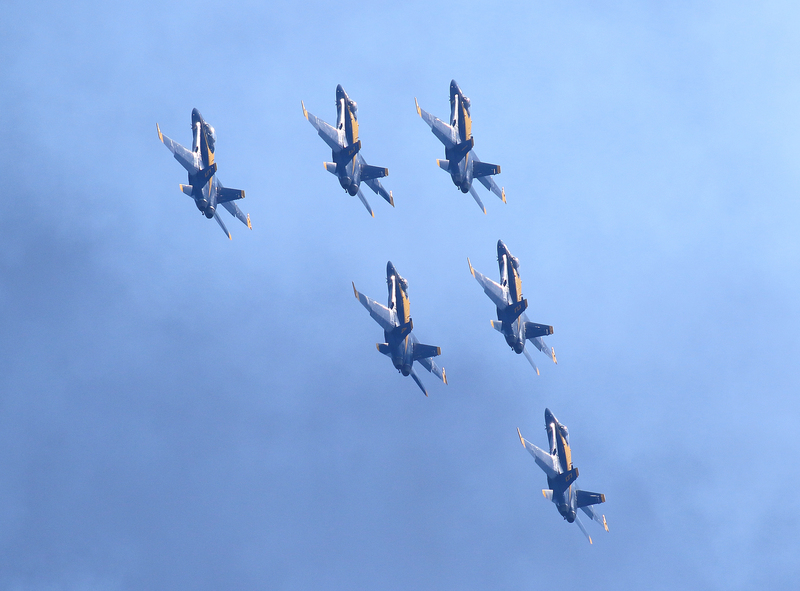 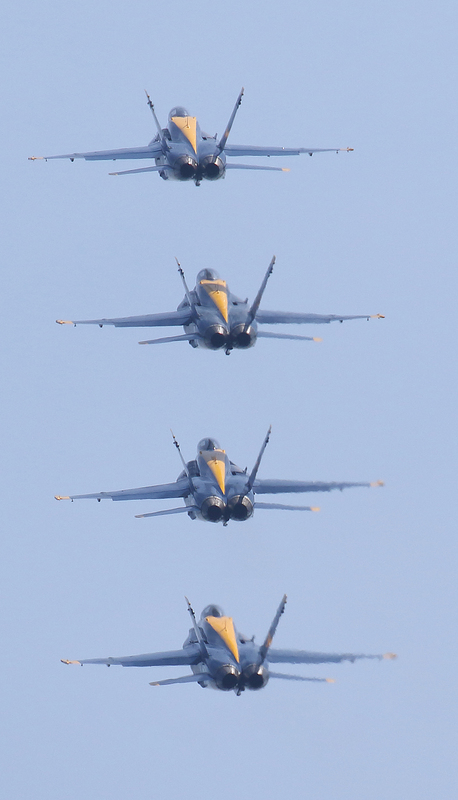 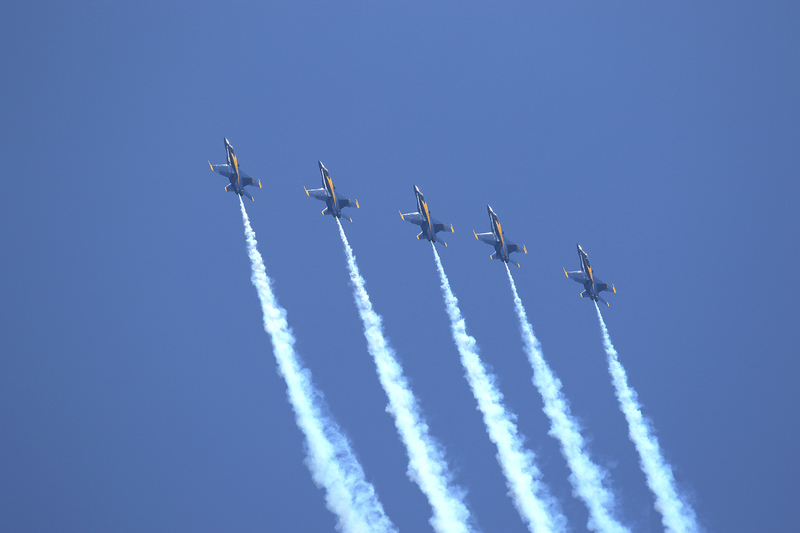 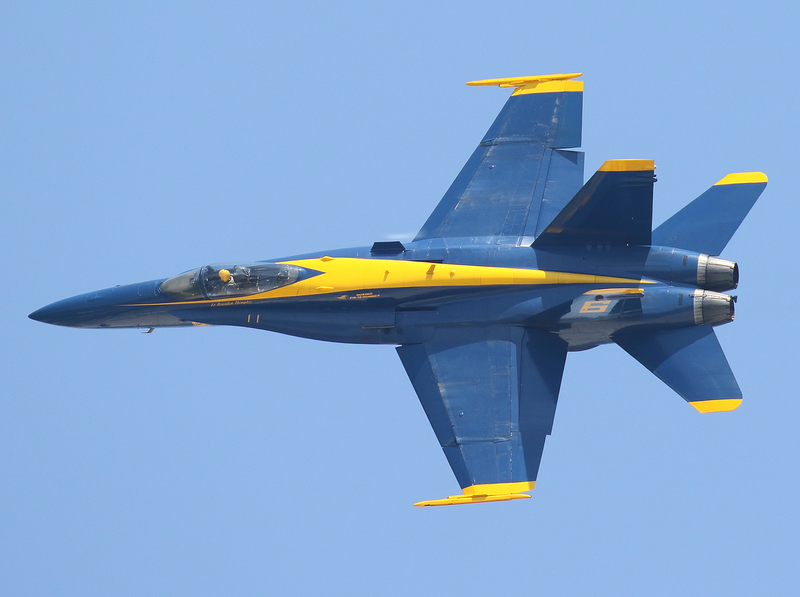 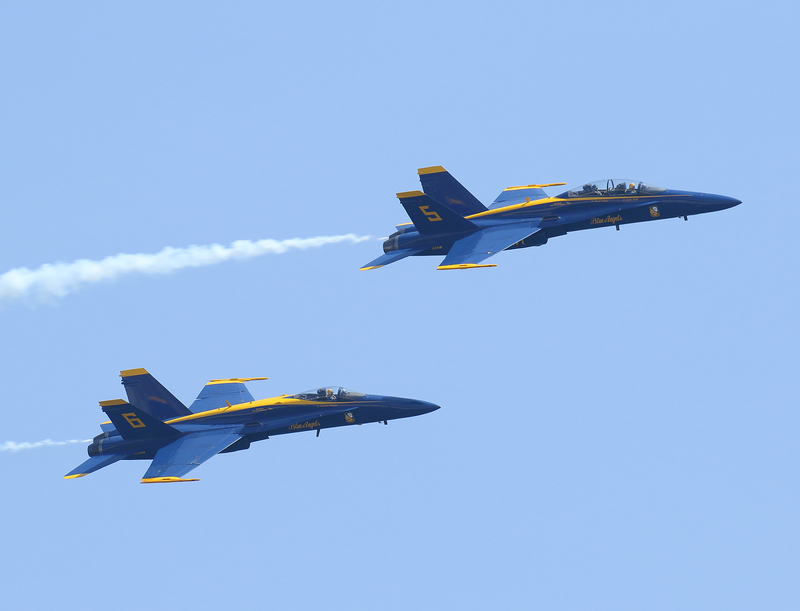 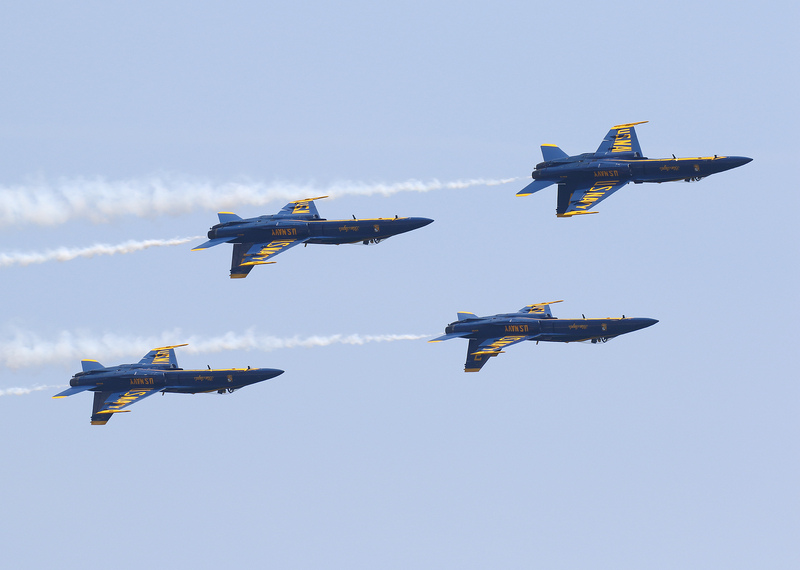 Flying their Blue and Yellow F/A-18 Hornet jets, they wowed the crowd with a superb show of tactical and precision formations along with the fast paced action of the soloists. 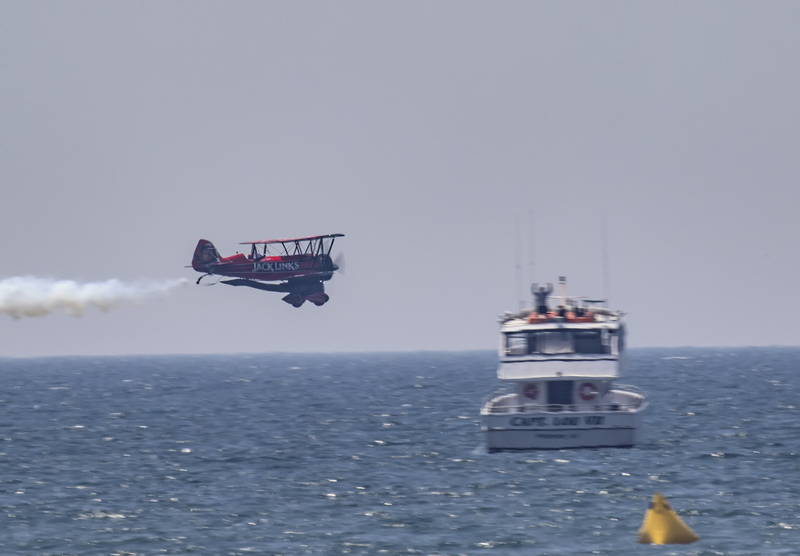 The air show delivered an action packed day of entertainment for all. 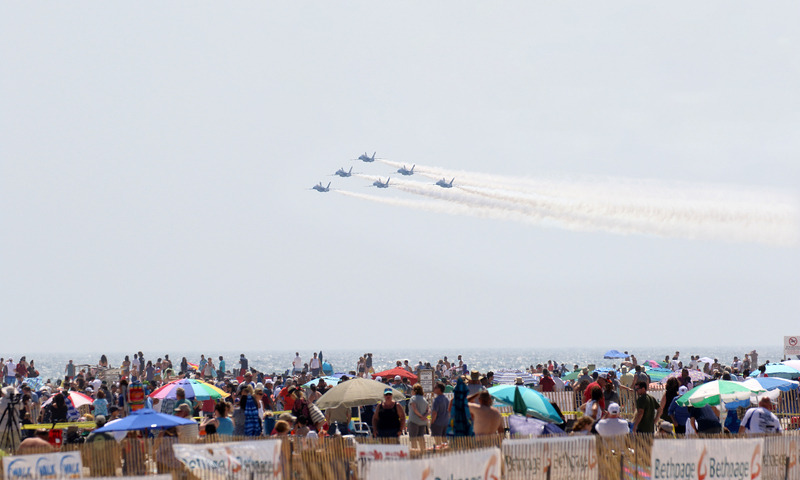 Kudos to all the performers for bringing their best to the beach. 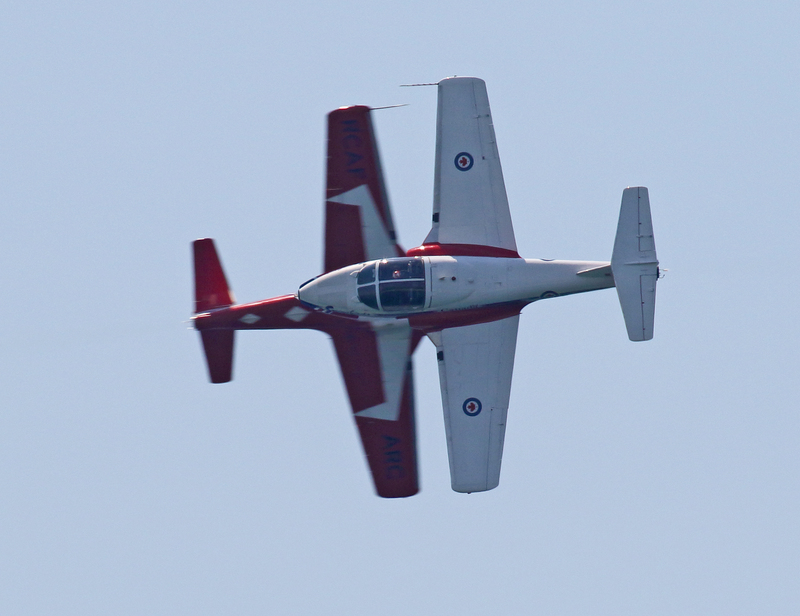 Looking forward to next year’s 16th annual show. 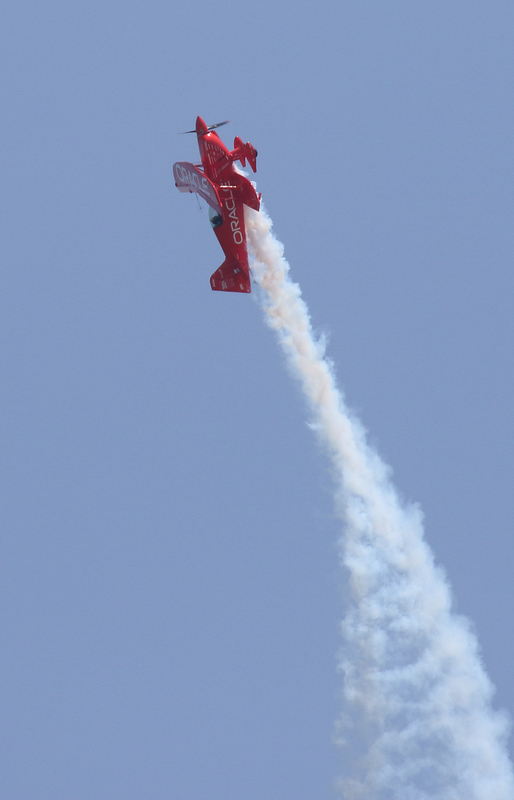 Isaac Lebowitz is from Long Island, New York. 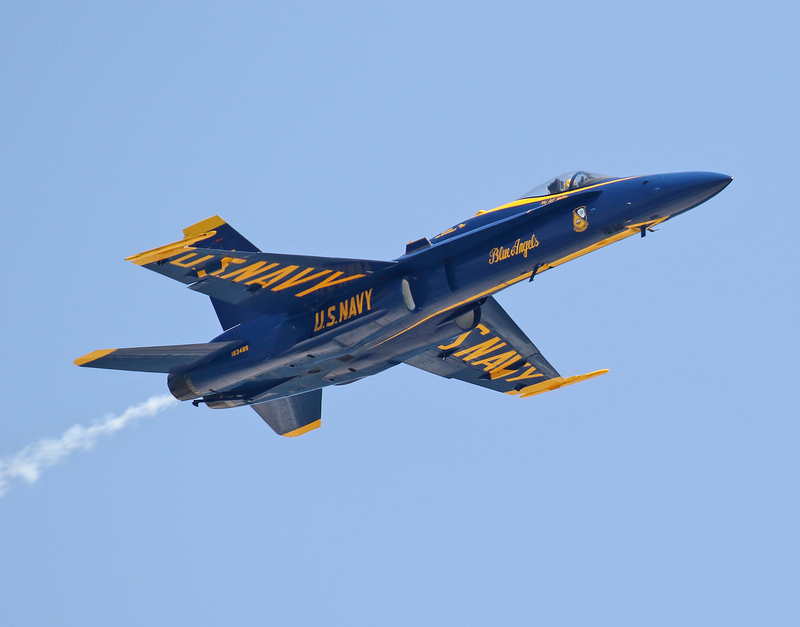 He works as a software developer in the accounting field. 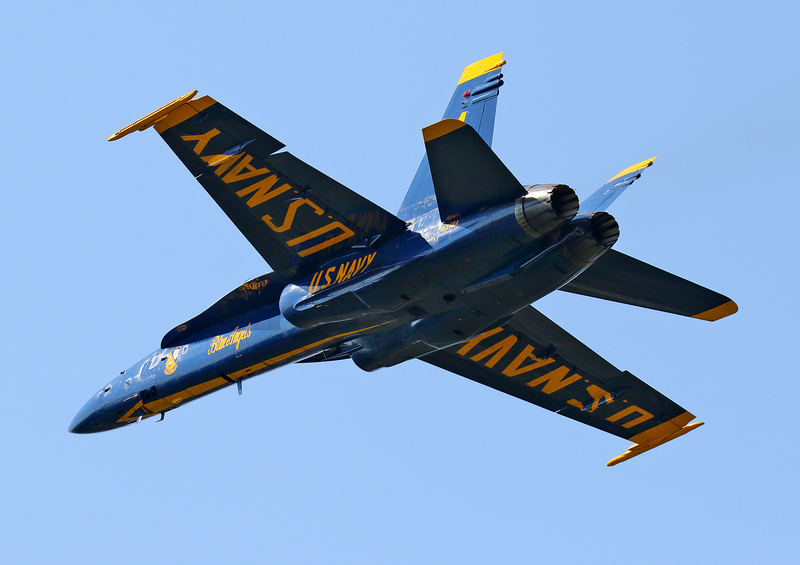 He has been involved with photography since receiving a fully manual SLR as a teen. 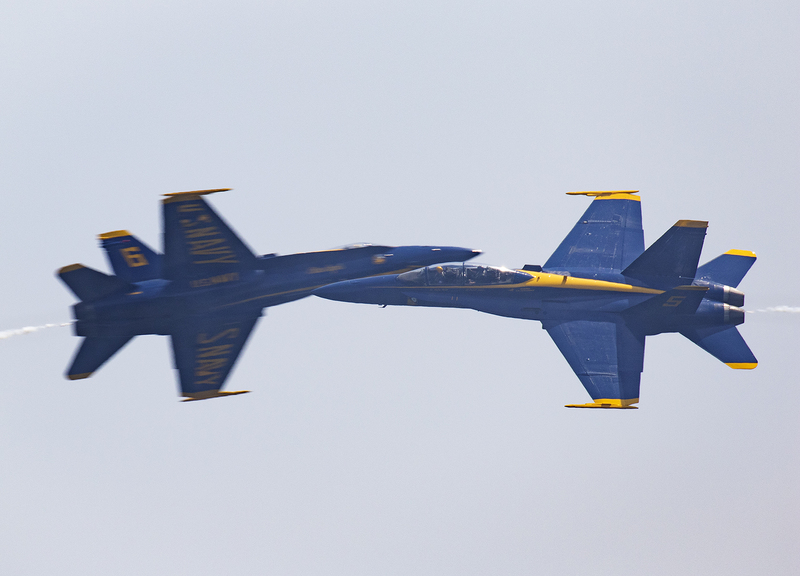 Having a keen interest in aviation and motorsports, he spent much time shooting both. 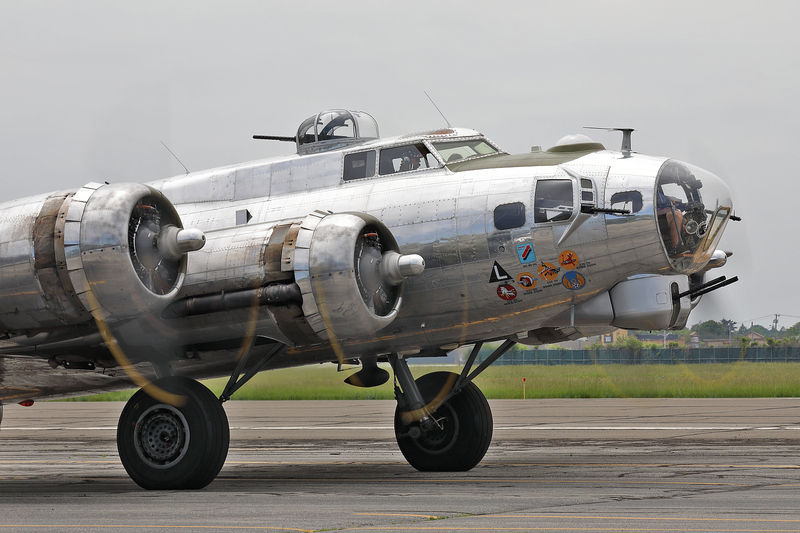 His primary aviation focus is on military aviation photography, although a day spotting at JFK is a real treat. 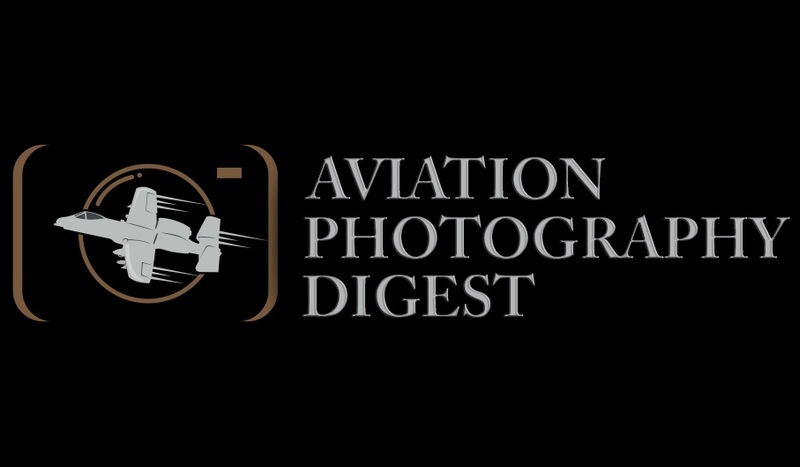 He also enjoys macro, night and HDR photography.